After a tremendous response to the first edition of its unique tourney – ‘OneTime’ in July, India’s largest poker site – adda52.com is back again with ‘OneTime’, giving players a chance to win INR 10 Lac GTD in first place for just 1K buy-in. That is not all, there is INR 1 Lac GTD in store for every player making it to the Final Table (2nd- 8th Rank) in this tournament happening on 14th October at 5 PM! A Final Table Booster Tourney with Ek Ka Dus Up for Grabs! Adding to your delight, the poker site has finally revealed a big news! Even if you miss the top spot in this tournament, you can still take home INR 10 Lac finishing on the Final Table. All you have to do is play 3000 hands on 100/200 above tables from 6th-14th October 2018. Last time, it was Ragesh Mishra who won ‘OneTime’. Who will take it down this time? No surprise, it could be you this time? To the delight of poker players in the country, adda52.com is offering multiple exciting ways to win a seat into this much-awaited tournament. The poker site is hosting a range of online satellites, giving players a chance to win tickets to ‘OneTime’ for as low as INR 100. The satellites have already started from 8th October and will continue running daily at different time slots till 14th October. Alternatively, players can also choose to enter this event directly by paying a nominal buy-in of just INR 1000. In addition to the online satellites, some exciting contests are also being run on Adda52 Facebook page, with multiple free tickets up for grabs! So, what else would you ask for? 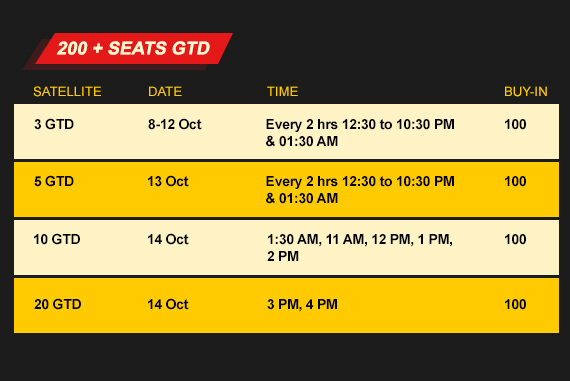 So, if you are looking to make Ek Ka Dus this week on adda52.com, charge up your gaming skills for the final table booster – ‘OneTime’ on 14th October at 5PM! Good luck for the super-value tourney!